Hawaiian royalty came here for generations… to relax and enjoy themselves just as we do today. 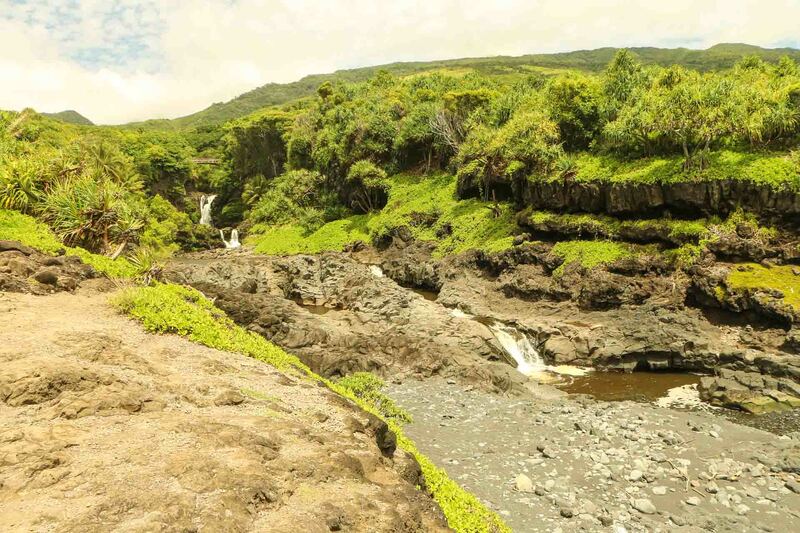 You’ll see why if you just spend some time hiking up through the jungle, past the lower pools which are down by the sea and let the magic of Oheo Gulch take your stress down a notch or two. The water gushing down over the rocks can be quite loud at times, especially if there has recently been rain on the mountain above, but it’s a welcome change to the usual sounds of the city and suburbs. It’s refreshing and energizing in a subtle, yet powerful way. The scent is fresh and filled with the slightest hint of fragrant flowers, all very lightly wafting through the air as you walk past the greenery and occasional bloom. Depending on the time of the year, there can be all kinds of interesting floral finds! Some of the exotic, amazing flora found here exhibits an unusual trait called “gigantism”, meaning they are extraordinarily large sized, so don’t be surprised if you feel as if you’re actually physically smaller! It’s a wonderful side effect of special genetic variations which, when combined with plenty of rain and rich volcanic soil in a rainforest environment, result in super-sized flora! 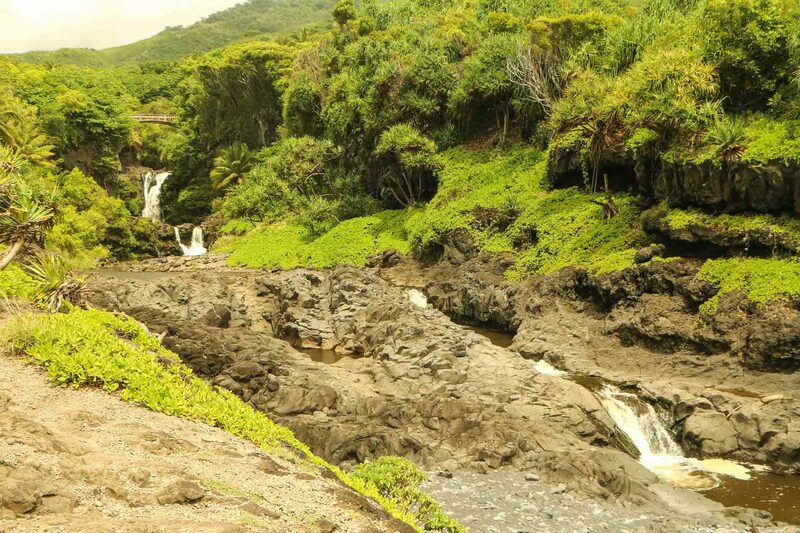 Oheo is known for it’s famous tiered waterfalls and pools. Depending on the amount of rain that has fallen up on the mountain, the intensity of the waterfalls can vary wildly. The water flow is created by rain which falls high on the mountain and takes a few hours to trickle down and depending on how much falls, there will be a little or a lot of water gushing down. There have been many serious injuries and even deaths from people jumping into the pools from the top of the waterfalls. A good rule of thumb is – if there is a sign, it’s there for a reason so take that into consideration before you decide to try your luck. Water depths can be deceiving at times and so it is best to explore before you jump in… maybe walk in and go for a swim first? Presently the pools are open now that the flash flood alert system located above the lower pools have been turned on. Many people have died in the past, due to flash flooding here and the park rangers are very safety conscious. The weather changes often so check before you go! Be sure to always check the weather the night before you leave so that you can be prepared for whatever weather you might experience. That said, warm to hot , (and always humid), is the most common forecast, but heavy rain and strong winds, if there is a storm front nearby, isn’t unusual either. It’s always a good idea to make sure you bring a thin rain jacket and a light sweater with you when going to Hana and beyond. Also, if driving it yourself, be sure to have a spare tire and all other emergency road equipment you might need with you. Check everything you are bringing with you before you go because there is no gas station or immediate help between Paia and Hana. Keep in mind that unpredictable weather has been known to cause nothing short of a petite menu of natural disasters on the road to Hana and beyond. Rock and mud slides to flash flooding which could force you to stay the night in Hana or in your car somewhere along the backside isn’t all that uncommon. Therefore, it’s always advisable to be completely prepared if you’re going to be going to Hana on a big, self-guided full-day adventure so it doesn’t turn into a little, self-guided nightmare. 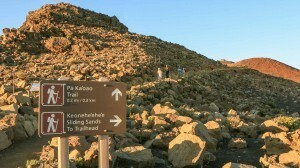 Accessible by taking the Haleakala National Park entrance at Oheo. The entry point is right across from the parking lot. 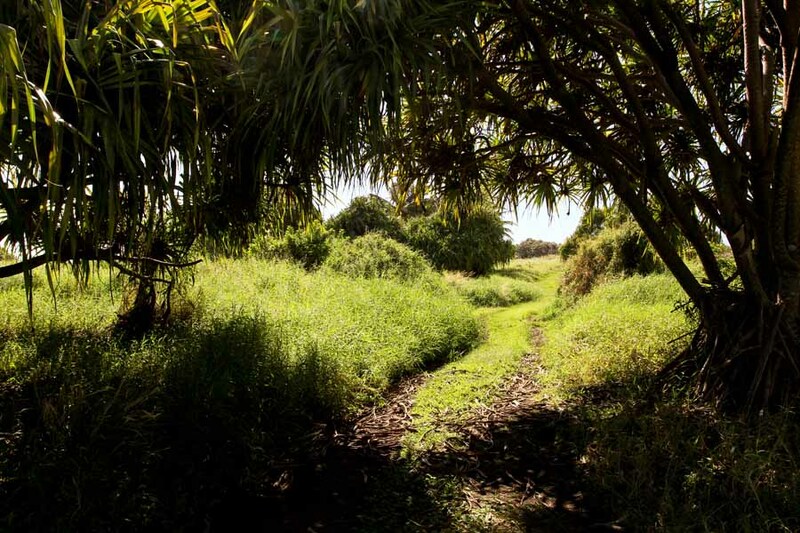 Please note that the jungle path can get slippery so make sure you’re wearing appropriate shoes (sandals and bare feet are NOT recommended footwear for hiking and exploring in the jungles of Hawaii). 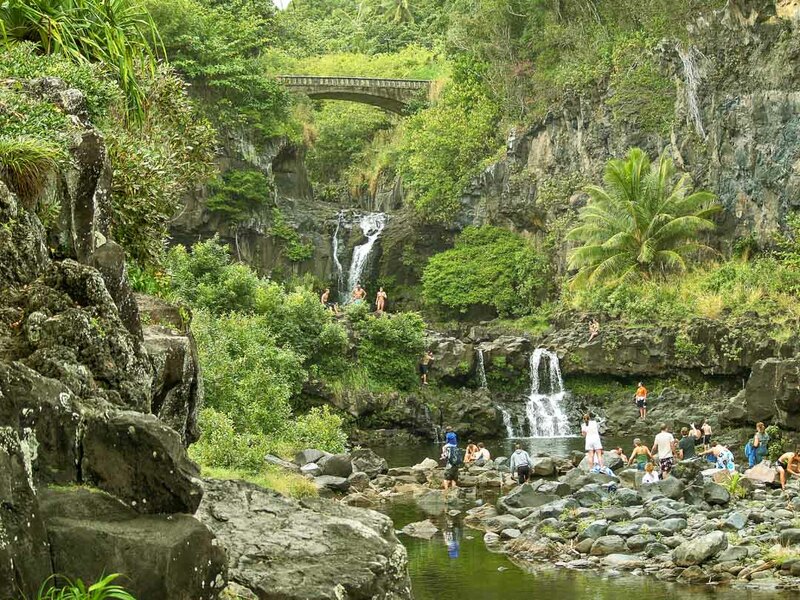 It’s a gorgeous, relatively easy 1.2 mile hike to the impressive Makahiku Falls which is about 200 feet high. It’s beauty is so surreal, it’s like a postcard. If you have a yearning, and the stamina, to continue on to see the banyan and so much more you can keep going. A word of caution about trespassing where fences and signs have forbidden you to go, although they are mentioned in Maui or Hana guidebooks. There are many dangerous spots highlighted in these books but what they tend to leave out are the risks involved in getting there. If there is a caution sign, then that means that many, many people have lost their lives! Most of them were visitors who didn’t think they had anything to worry about since it was written up in a guidebook, so “it must be safe”! Indeed the opposite is true. So, if you’re going to take risks and go off trail or under a fence meant to deter you, or past a posted “Caution!” or “No Entry” sign, just know that you are violating the law and you’re completely on your own should something happen. Meaning, if you are trespassing and you seriously injure yourself you can expect a long wait for any kind of help, serious fines and enormous fees for emergency services – like EMTs and the helicopter flight out (which will easily be in the tens of thousands of dollars). And, since you were intentionally trespassing, your insurance company will probably decide it doesn’t have to cover you and you may end up fighting them on this point. So, it’s advisable to take a moment and seriously think about it before you go where you know you shouldn’t, just because some guide book tells you it’s there! One hates to burst the bubble of those who want to think of every cool spot in the islands as “sacred”, but this one simply isn’t. Yes, it was considered a special, favorite vacation spot by the royals for many generations, but that is all. It was modern day hotel owners in Hana who wanted to make it even more special and decided to create the idea of the “Seven Sacred Pools” as a marketing ploy in order to bring more tourists out to Hana. And, there are many, many more than just seven pools. 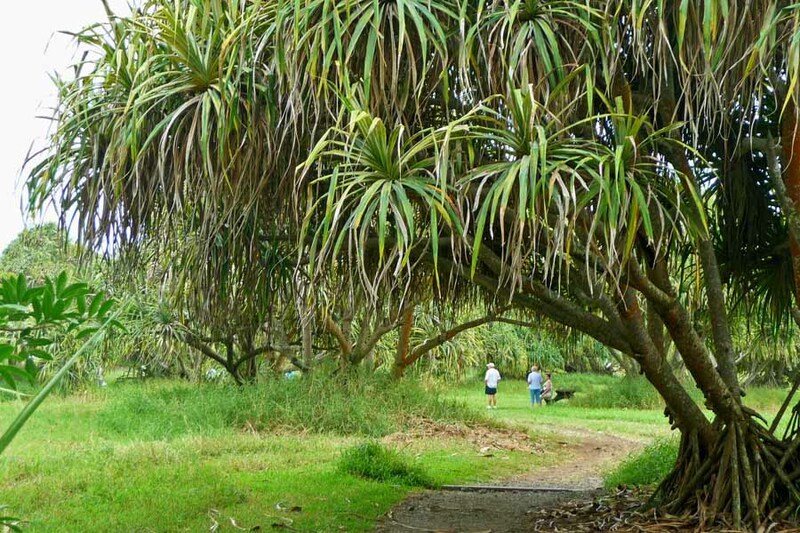 So, know before you go that there are a number of great spots, some are truly as they appear and others have had their names and/or histories embellished by local business owners and the many guidebooks on Maui. A great rule of thumb is… no matter what the weather looks like at your hotel or condo, be sure to call 808-572-4400 and hit Option 2 to make sure the pools are open and to find out what conditions are like out in Hana so that you can be sure to have your best day on Maui! There are two visitor centers(where drinking water is usually available) but there is NO FOOD FOR SALE in the park. 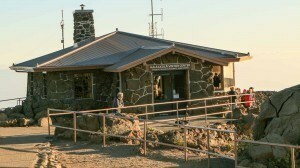 Restrooms are located at the visitor’s center.